For The Love of Art a group exhibition that opened at the newly refurbished Zebra Crossings Café on Addis Ababa Drive in Lusaka on Thursday last week is still showing in case you missed the launch. A sequel to Hidden Talents Revealed an exhibition that showcased work by about 10 little known artists at the same venue in February 2013, the current show also brings a new batch of newcomers to the public eye. One or two of the featured artists such as Candice Rogoff and Montfort Chinunda – or Monty as he signs his work – are familiar because they have exhibited here before. The other artists, about 12 in total are all new and exhibit varying levels of artistic ability. Frankly, it appears a number of them, if not all are hobby-painters that belong to an art club that meets at Ababa House once a week. Also, quite a number of them appear to be of South African or Zimbabwean extraction with a European settler ethnicity and much of their work is heavily influenced by subject matter from their heritage such as still life arrangements, bird watching, game viewing and farming, but generally the works do provide an entertaining selection of art. 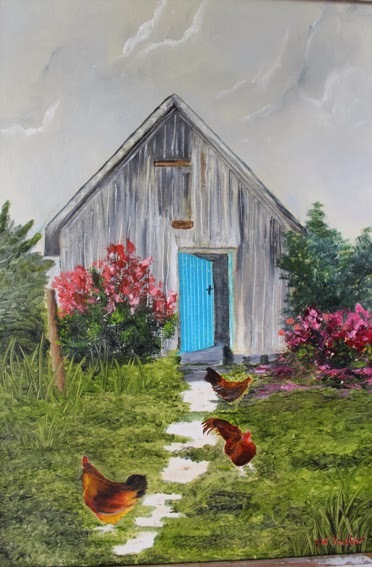 Wilna Venter has some very picturesque oil paintings of farm life in her works Chicken and Karoo Windmill – in case you were wondering, the Karoo is a semi-desert in South Africa that was once occupied by the Trekboere, a group of nomadic pastoral farmers descended from Dutch colonists. 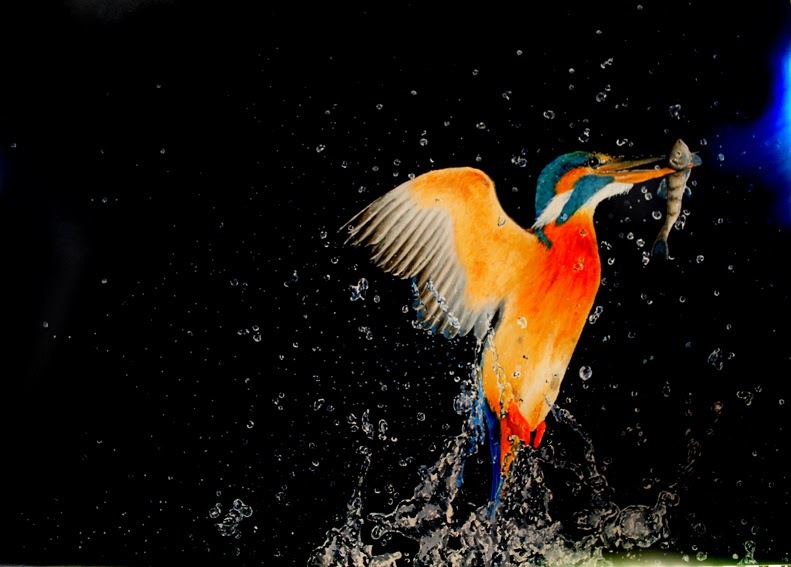 Stella Dubler gives us a convincing attempt at hyperrealism; she does not do it with the clinical precision of Dirk Dzimirsky – the German hyperrealist painter featured in this column in July last year -- but she does manage to paint realistic portrayals of fishing birds birds pouncing on their prey and these are executed in photographic precision. Dubler paints every last drop of water making her work quite realistic as can be seen in Caught in Action. 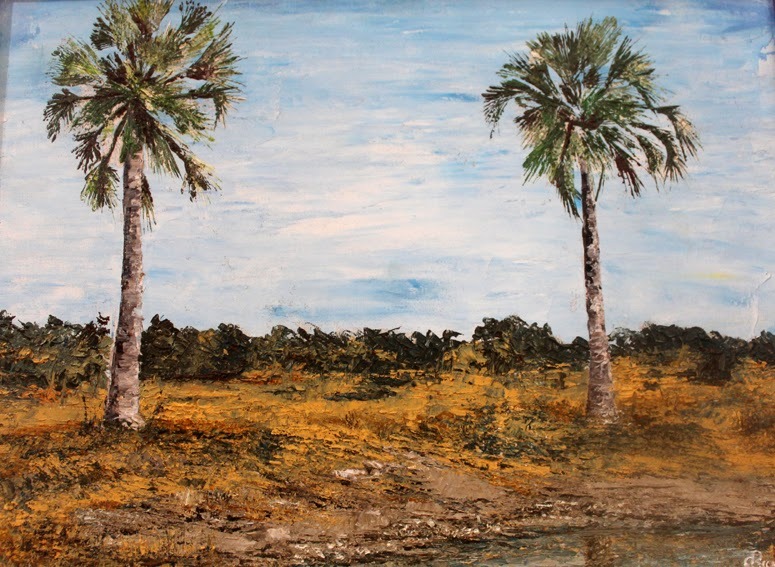 Charmaine Bowker provides some very painterly and charming landscapes as can be seen in Twin Palms which is finished in oil on board. 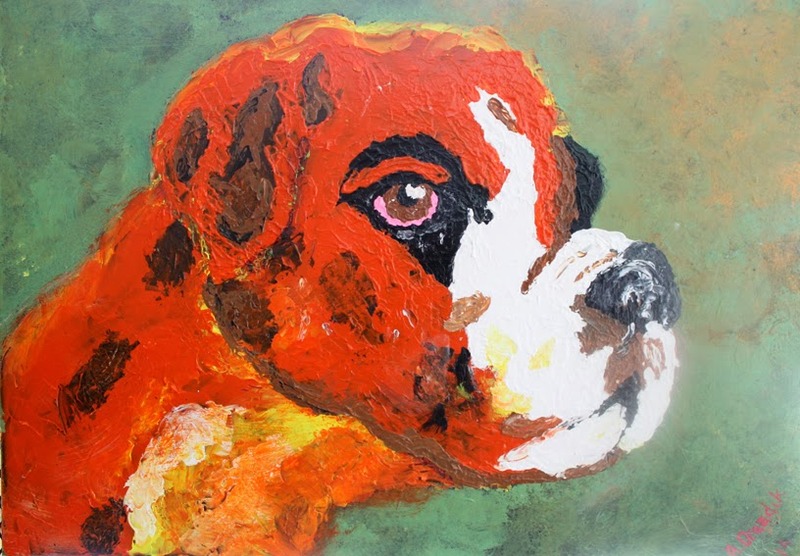 Also showing strong painterly skills is Ashleigh Drazdik and Boxer, a large painting of a dog is finished in thick impasto showing that there was no paint to spare in her painting process. 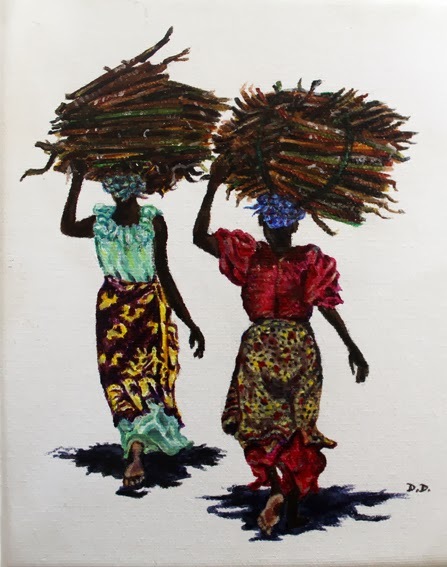 In works such as Gathering Wood, Daniela Denham gives a snapshot of everyday people depicting two women going about their daily firewood collecting chores, they have heavy loads on their heads and their colourful chitenge waist wraps set against a plain white backdrop gives them a powerful focal emphasis. Monty has three paintings in this exhibition and two of them once again bare the annoyingly strong influence of his mentor Stary Mwaba’s work. The work Migration for instance is an absolute spinoff of Mwaba’s work. 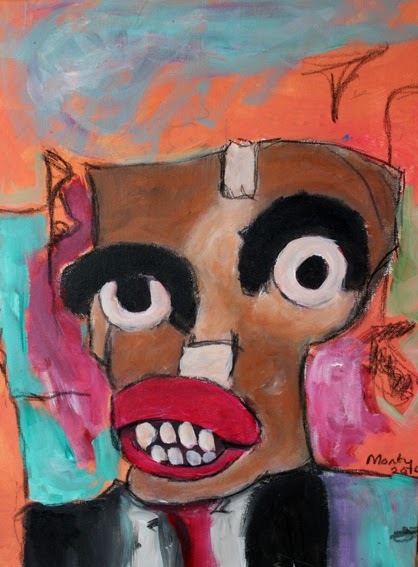 Monty openly borrows the ghostlike figures that are frequently placed in his mentors work and this time even the colour palette resembles that of Mwaba with its strong shades of browns and blues. There is no harm in being a protégé, but one must also work at breaking free, blending a mentor’s influence with one’s own originality which at least Monty tries to attempt in the piece Smart Montylicous an abstract portrait which is relatively original save for the thick lips, gaping mouth and large teeth of the subject that could have been lifted off Mulenga Mulenga’s Father Who portrait series exhibited during the Small Works and Miniatures Exhibition at the same venue last December. Nevertheless, For The Love of Art is an exhibition of works by artists who enjoy doing what they do and probably have fun while doing so, the works are not pretentious although some of them may be overly flippant and just a little too decorative in nature, lacking a pinch of depth and a splash of seriousness, but as usual the Red Dot Gallery – alongside The Art Shop -- once again helps to add its welcome contribution to the Lusaka gallery circuit. Meanwhile, renowned artist Enoch Ilunga has bemoaned the resent death of prominent lawyer and former Constitution Review Commission chairperson Wila Mung’omba who died at the age of 74 in South Africa early this week. “Wila Disraeli Mung’omba was like a father to me, he supported me fully. I met him in 1977 or 1978 somewhere there long before he went to work in Abidjan at the African Development Bank. He continuously supported me and even gave me a brand new Toyota pick-up with a canopy, free of charge,” explained a visibly touched Ilunga during an interview in the Lusaka Show grounds this week. He described the late Mung’omba as one of the few indigenous collectors of Zambian art, an unsung hero with regards arts patronage. “For me it is a very big shock, he was a man of class, very elegant, even when he was chairman at the ZCCM he supported me. But it’s not just me alone it is also other artists, we have lost a true indigenous patron this is a very big blow to the visual arts in Zambia, a sad time indeed. We have lost a collector”. Of late, the issue of religious fraud has been a hot topic on the lips of many. Late last year, The Post columnist Edem Djokotoe was brave enough to examine it from a journalistic point of view in a very insightful five-part series entitled Salvation for Sale, which earned him blistering condemnation, according to some readers’ mail he shared in the paper. But as the saying goes, belligerence is a useful quality in journalism. Djokotoe stood his ground against the brimstone and fire laden e-mails from a number of devotees throughout the duration of the series and tried as hard as possible to tell his story with righteous regularity. 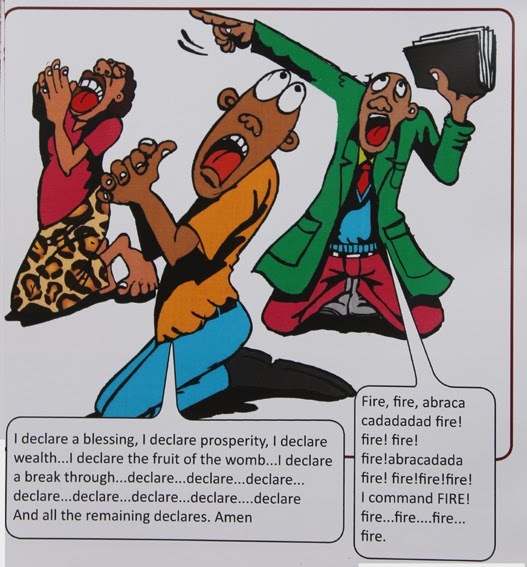 Likewise, Liyali Nasando, an artist based in Mkushi published University of Life, a 30 page illustrated booklet that also tackles the issue of “Prosperity preaching” in churches. Done through easy-to-read comic illustrations, Nasando, a devout Christian himself fearlessly takes a swipe at those preachers with an inclination to the prosperity gospel. A brave thing to do indeed in a country whose citizens pride themselves as a Christian nation and also considering preachers and congregations alike will be quick to pull out the “Touch not my anointed” scripture – in reference to Psalm 105:15 -- as a defence exempting them from a myriad of irregularities. Nevertheless, this year Nasando has published his second edition, University of Life 2 and the message remains pretty much the same except this booklet is a few pages shorter and is printed in full colour. “What prompted me to do the project was the fact that there is a steady degradation of morality in society so I thought that I should be part of the solution so I came up with this booklet which is premised in inculcating Godly values in today’s society,” says Nasando who sees himself as an evangelist that uses art for Christian ministry. “The biggest challenge that we have is that we have clouded out God and people are living life according to the dictates of their own conscience and some of the clergy have taken advantage of this. Today most of the popular pulpits are smouldering with the prosperity gospel unlike the core concept of human existence”. In the introduction, he suggests the rationale behind the booklet’s title is that God is the lecturer, man the student, the Bible the book of instructions and life itself the university and at the same time the area of study. 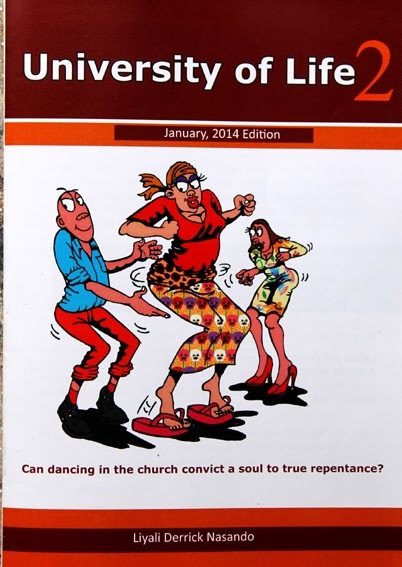 Nevertheless, apart from scrutinizing the shepherds, Nasando also examines their flock and questions whether dancing in – for instance -- Church can “convict a soul to true repentance?” in obvious reference to the trouser-tearing and waist-wriggling dance antics that can often be seen in churches and on the television these days – which one might add is hard to distinguish from any hard-core secular dance. Still on the flock, the artist also questions what he terms “unbiblical ways of praying”. Anyway, by general observation, like any other booklet or publication, one can observe a few drawbacks as well as strong points in Nasando’s latest edition. To start with the drawbacks, the pages of the new booklet are quite few compared to the last edition and one might suggest the author could have exercised a little more patience and combined the two, since there is not much difference in the content save for the colour print. This way he could have printed more copies seeing the combined print runs of the first and second editions are less than 1000 copies in total. Also, he may want to work on a much broader distribution strategy. He already has a specific target audience that can be reached through Christian or School bookshops, however, the booklet can only be purchased from his publishing partners Juziel Digital Printers in Lusaka and Ndola. But obviously the limited print runs are owing to the fact that beside the support of his printers, he has no other sponsorship to help cushion the cost and he is therefore printing it on his school teacher’s salary, which obviously is not that much. Turning to the strong points, the book’s carefully selected Bible verses, easy-to-read layout and colourful imagery could easily make it a favourite among school going Christians or on the coffee tables of front desk reception areas. And if the artist’s intention was to make the drawings appear like cartoons for a bit of humour, they do not really deliver in this area but their strength however is in driving home his Bible inspired messages as witty illustrative tool. Still, looking at his unrelenting drive and the fierce energy to keep producing these booklets it seems there are many more editions of the University of Life series to come and clearly with every edition Nasando will gain more experience to place him in good stead as a Zambian author of illustrated booklets. 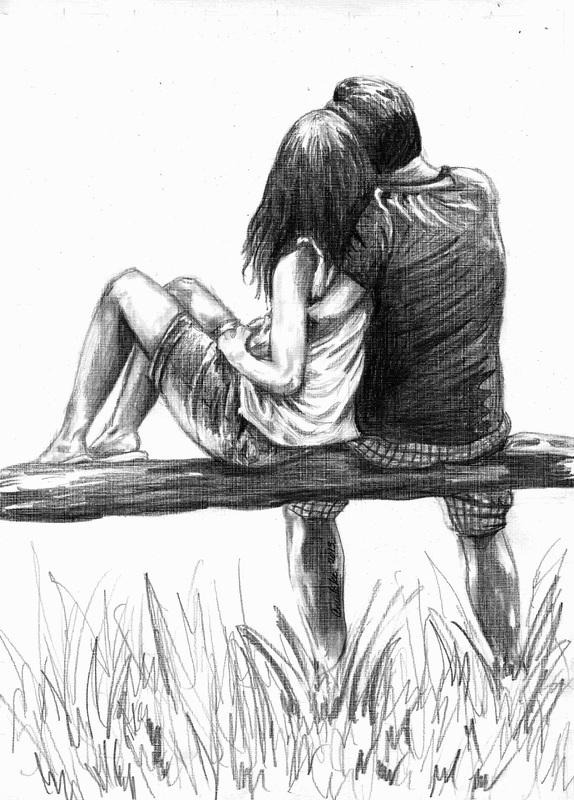 Besides, publishing is no easy task at all, otherwise every other person would have written something by now. For the past two years, he has been an English teacher at Chumwe Primary School in Mkushi district – which happens to have Grade 8 classes although it remains a primary school. Before joining the school, he was employed by USAID as a graphic designer and layout artist after having left Chudleigh House School in Lusaka where he initiated a once popular School Art Festival. 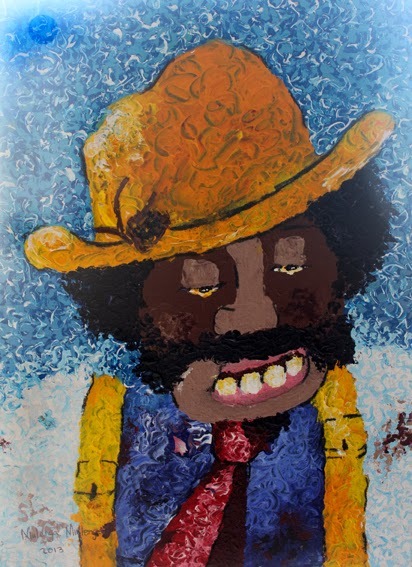 Prior to a teaching career, he simultaneously studied for an Art Teachers Diploma alongside Graphic Design at the Evelyn Hone College graduating in 2003, but it was after completing Grade 12 in 1996 that he was inspired to take art seriously after some years of apprenticeship under his Livingstone-based mentor the seasoned painter Vincent Maonde. Similarly in the spirit of mentorship, for the two editions he has worked with two school-going children namely Chola Nsemiwe for the first and Maurice Kakoma for the second edition, both of whom are in Grade 11 this year. For now he intends to continue working in a rural area because he believes this environment has its own enchantment, and a serenity that soothes and enhances one’s imagination which he supposes can be hard to achieve in large cities. We are already a month into 2014 but it is not too late to list a handful of promising rising stars that are bound to make an impact on the Zambian art scene this year. In the author’s humble opinion there are five, imminent stars who stand out from the rest of the pack, of course they vary in terms of experience and this draft class is not deep but there is still plenty of potential and promise in the bunch. One could make an all-inclusive list with every rookie on the scene, but that would be long, boring and uncompetitive. So unfortunately, some very worthy candidates did not make the cut. You have the hard-working Mapopa Manda, Rabson Phiri, David Makala, Owen Shikabeta, Chifuchi Kandala and Montfort Chinunda who will eventually have their own features in this space but there was no room on this list. Nukwase Tembo, Othiniel Lingwabo, Ngandu Mwaba, Suse Kasokota and Alumedi Maonde are other solid candidates who will have to shine here another day. Caleb Chisha already got a Hole In The Wall spotlight and his epic contributions to almost every major exhibition last year has him poised for celebrity, yet even he is not on this list. Nevertheless, here we present a quintet of talented young artists who have all the tools to be dominant forces, and one exciting thing considering last week’s edition of this column which was entitled “Where are all the female artists?”, three out of the five are female. First up is 25-year-old Emmanuel Chibaye of Ndola. 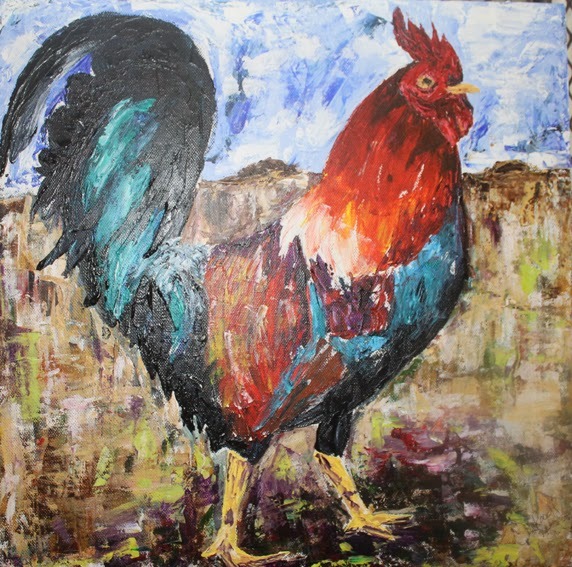 He completed a Diploma in Art and Commerce at the Evelyn Hone College last year but really caught the art-loving public’s attention when he featured in a Start Foundation exhibition for emerging artists -- a good measuring stick for talent -- at the 37d Gallery in Lusaka. 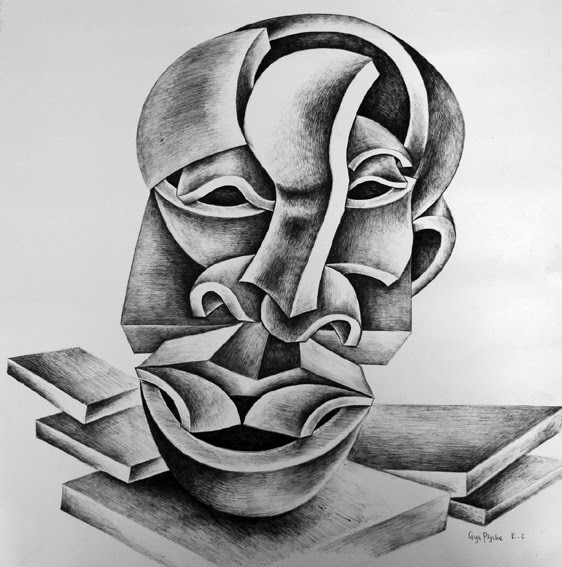 Working mostly in pen and ink, the abstract, mask-like portraits he presented during this show won the hearts of many probably owing to their surreal quality, borrowing heavily from either the Spanish painters Salvador Dali or the Congolese maestro Cheri Samba. We did not see much of Chibaye after the 37d show, but if he could just get his act together this year with regards exposure, he could be showered with accolades in 2014. Next on the list is Gladys Kalichini, a 25 year old painter who interestingly holds a Bachelor of Arts Degree in Economics with a minor in Demography (Population Studies) from the University of Zambia, something totally unrelated to her creative practice. Upon returning from Botswana where she lived with her parents, she explored and acquired an introduction to art as a profession through apprenticeship at the Arts Academy Without Walls in 2008. Hard work and determination coupled with exceptional talent earned her two Ngoma Awards, her first being in 2010 when she was just 20-years-old and her second in 2012. Although she was not that active last year, owing to the demands of her final year ay UNZA, we should expect her to be on point this year. Fascinated by the social and cultural dynamics which she subtly incorporates in her works, she uses art to bring attention to many social inadequacies especially the minimum female participation in the Zambian contemporary art scene. She is also a member of art4art which is a non-governmental organization which uses art to bring about social change in various communities. Mulenga Mulenga is next on our list, arguably the hardest working female artist in the country, this multi-talented 26-year-old is a painter as well as a sculptor. When working with paint, she blends raw acrylic colours with charcoal using her palette knife for effect. Most of her themes as an artist centre on celebrating children or early childhood, she expands on a formula she calls Kutangila, inspired by her farther a part-time artist. The concept is centred on an old Bemba saying Ukutangila tekufika (loosely translated it means the first to start off is not the first to reach). 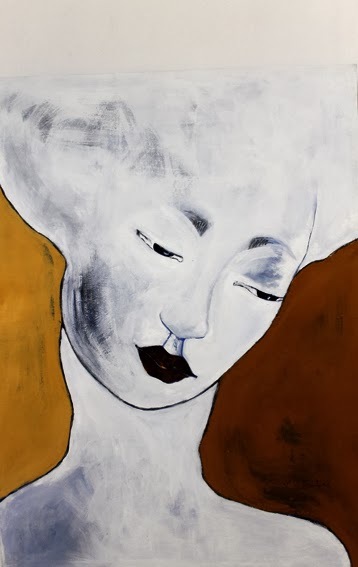 She relates this to the fact that her father supported her art career with this in mind, looking at Mulenga to finish off a journey which he started but has not arrived with regards art. She holds an Art & Design Diploma from Evelyn Hone College of Commerce and Applied Arts and has been quite instrumental in running affairs within the Insaka International artists Trust where she has been mentored for leadership under the apprenticeship of Visual Arts Council Vice-chairman Zenzele Chulu. Ignatius Sampa is another young artist that deserves mention on the list although he disappeared off the radar in 2011 after surprising us with a painting entitled Makishi Last Supper which was subsequently purchased by the Lechwe Art Trust making him one of the youngest in the prestigious Zambian collection as he was only 20-years-old at the time. Anyway, Sampa returns full of energy and he gave us a glimpse of his recent work during the Artmas exhibition at the Henry Tayali Gallery. He still works with the Makishi masquerades as a concept but there is no telling what he will do with them next. He has had no formal art training; however, he took up art seriously in 2005 when he was only 14 years old after being advised to join VAC by Dominic Yombwe. 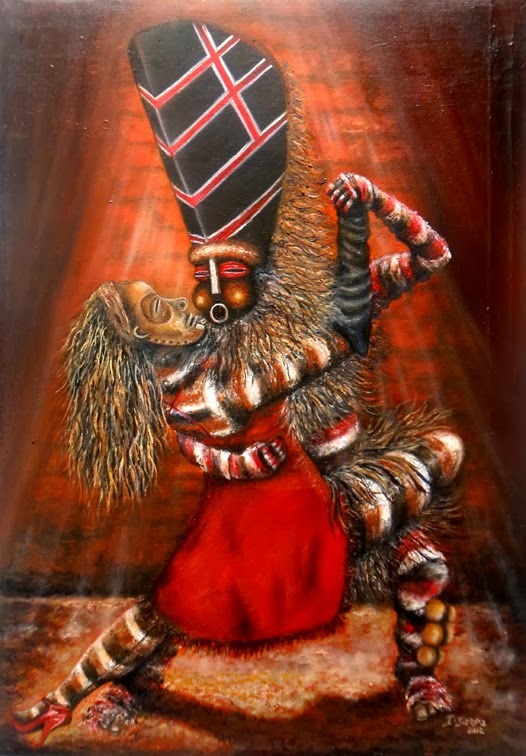 He has also received mentorship from Caleb Chisha – just five years his senior -- although he draws inspiration from Livingstone based artist Lawrence Yombwe when it comes to his colour palette and technique. Last but not least is Alina Mateke of Livingston. When this 17-year-old bravely tested the not-too-friendly waters of the art scene by featuring work in Kamulanga, the high-ranking 20th UNWTO general assembly main art exhibition at the Livingston Museum last year, she was not afraid of the outcome. Fortunately the courage paid off, because not only was her work well received she ended up being one of the darlings of the exhibition and this would later encourage her to visit the capital and feature in the Independence Art Exhibition. Of course she still has a long way to go and remains slightly undecided in terms of a career path, but her unbridled enthusiasm and immense talent put her in good stand to become one of the most popular artists on the scene if she keeps her foot on the peddle, or rather brush on the canvas.